Swachh Vidyalaya Puraskar is an integral part of Swachh Bharat Swachh Vidyalaya, initiative started by the Modi government in the year 2014. This year the SVP has completed one year and for the next financial year registration has been started. Schools from across the nation can participate in this SVP initiative. Swachh Bharat Swachh Vidyalaya was started in the year 2014, when the Modi government has realised that due to low quality sanitization and water supply in the schools, many a students are dropping out midway. The students, especially girls are forced to miss or stop their school when they reach adolescence age due to unhygienic system in the schools, mainly in rural areas. Looking at such situation the BJP government has started this initiative namely Swachh Bharat Swachh Vidyalaya Scheme in 2014 for making the schools cleaner and better. With better water supply, sanitization, hygiene and other elements related to cleanliness the scheme has started operating from the same year. 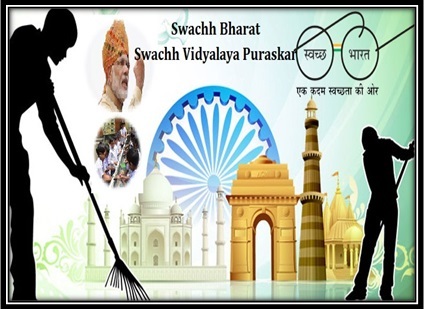 In the year 2016, after starting up the SBSV initiative in India, the central government has announced about the new initiative namely Swachh Vidyalaya Puraskar 2016-17. This is an award basis scheme under which the schools and the educational institutions across the nation will get awarded for cleanliness and hygiene. This initiative was taken to encourage and inspire all the schools in the nation to have better sanitization system in schools. As a result students, mainly girls will not leave/stop schools midway for health issue or unhygienic system. This will enhance the health of the students as well. In this scheme (initiative) the schools will be ranked and awarded on national level by the central government of India. The ranking will be done on the basis of cleanliness, water supply, hand wash, sanitization, maintenance, behaviour and other things related to Swachhta or cleanliness. This will be the first time in India when an educational institute will be ranked and awarded on the basis of hygiene and sanitation. In the year 2016-17, there are 35 states and Union Territories had participated in the SVP. More than 640 schools were being chosen by the states and 172 schools were being shortlisted for the national award under this initiative in the year 2016-17. This year the initiative has extended to the private schools as well unlike last year. In the year 2017-18, the number of participants is huge; it reached 2, 68, 402 schools. Extending the initiative to the private schools has made it bigger than previous year. All the students from these schools have participated in various activities related to Clean India. They are named ‘cleanliness ambassadors’ by the authority. This year the central government has included private schools and aided schools along with government schools in urban and rural areas. Only online registration is available for the Puraskar. All the schools have to register their names under the official web portal of Swachh Vidyalaya supervised by the Ministry of Human Resource Development. There are few easy steps through which one can register the name of their school in the web portal http://www.swachhvidyalaya.com/. Step 1: Click on the official link for the Swachh Vidyalaya http://www.swachhvidyalaya.com/. In the home page the applicant will get a tab ‘Apply’ in the main menu bar shown in the page. Click on the ‘Apply’ tab to proceed. Step 2: By clicking on the ‘Apply’ tab, the applicant will be redirected to the options for ‘How to apply’ for the Puraskar. Click on the second option that is option B ‘Online Survey’ to get the registration form. Step 3: The Registration form will be appeared on the screen where the basic and primary information regarding the school must be entered. School name, category, government or aided or private, number of students enrolled, teachers and staffs details, contact details and such information are required to enter in the form. Step 4: Click on the ‘Submit’ tab when all the mandatory fields are being filled up with correct information. After submission of the form a system generated password will be sent to the mobile number given in the form. That password will be the one to login to the web portal. Step 5: There are 5 more sections under ‘Online Survey’ for filling up. The school authority has to fill up the forms accordingly and submit them one by one to finish the registration. Step 6: Once the registration is finished, the schools will be notified about the next process by the authority through phone or email ID. The school authority has to make sure to provide correct and valid contact details. A sample registration form is available in PDF format in this following link http://swachhvidyalaya.com/SVP%202017-18_Survey_format.pdf. For more details one can go through the page. In the registration form all schools have to enter the U-DISE Code. This is a mandatory field. If any school does not have this code then they can download DCF or Date Capture Format from the link http://www.dise.in/Downloads/UDISE_DCF2015-16.pdf and submit this to the district / block / state offices. Further the officials will generate the UDISE codes for the schools. Thereafter they can enter the code in the registration form. The registration has been started from 1st of September and will last for 15 Nov. Within this span of time all the schools have to register under the portal by filling up the registration form. National Level: In this level only Green category schools are eligible. National level is open for Green categories only. State/Union Territory Level: Under this level along with Green Category schools, Blue rated schools are also eligible. That means this is open for Blue and Green Category schools. District Level: Under this level Blue, Green and Yellow category schools are eligible. That is three categories schools are open in this level. There are few guidelines of the Puraskar. To participate in this initiative all the schools have to follow these guidelines. The detail guidelines are mentioned in the following link http://mhrd.gov.in/sites/upload_files/mhrd/files/upload_document/Eng_Swachch-Bharat-Swachch-Vidhalaya.pdf. For the Android Smartphone users, it is easier to register under this initiative. Mobile app for the Puraskar is available in Android platform. The users can download it from the Google Play Store. Also people can give a missed call to the number 07097298093 to get a link to download the application on their phone. Every year many a students, mostly girl students stop going to school after a point of time due to low quality of sanitization and cleanliness in the schools. Not only in rural but in urban areas as well they are facing the same problem in schools. To get rid of this the initiative has been started. The authority is expecting this initiative to become bigger in future as more people will join hands to have better place for the students in India. The central government has propagated the idea of maintaining high levels of cleanliness and hygiene in government as well as private schools. To encourage more participation and better outcome, it has announced special prizes for top three schools. The short listing is complete and three government schools from Haryana have been selected for the state –level awards. The school authorities will receive the reward on the 18th September, 2018 in New Delhi. The central government has announced that it will start next phase registration soon. For that, interested schools have to log on http://mhrd.gov.in. Here, all important details and guidelines have been highlighted. The schools can also submit their applications by downloading the Swachh Vidyalaya Puraskar smart phone application.